"Mario Kart DS (マリオカートDS) is a racing game developed and published by Nintendo. It was released for the Nintendo DS handheld game console in North America, Australia, and Europe in November 2005, and in Japan in December 2005. The game is the fifth installment in the Mario Kart series of video games, and the first to be playable via the Nintendo Wi-Fi Connection online service. 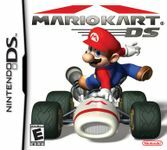 Like other games in the series, Mario Kart DS features characters from the Mario series, and pits them against each other as they race in karts on tracks based on locations in the Mario series. The game was well received, receiving an aggregated score of 91% from Metacritic. Praise focused on the game's graphics and gameplay, while criticism targeted its repetitive single-player mode. Mario Kart DS received several awards, including Editors' Choice Awards from GameSpot and IGN, G-Phoria's Best Handheld Game award, and IGN's Best Racing/Driving Game and Game of the Year awards for 2005. In the United States, Mario Kart DS was the best-selling handheld game in its first month of release, and also held that position the following month. Overall, Mario Kart DS is the sixth best-selling game for the Nintendo DS as of January 2009." Source: Wikipedia, "Mario_Kart_DS," available under the CC-BY-SA License.